1 Begin by getting your pan nice and hot over medium heat. Pour some oil and saute onions and garlic, then add Knorr Shrimp Cubes. Dissolve cube and continue to saute for another minute. Turn the heat up to high to cook the vegetables to a crisp. 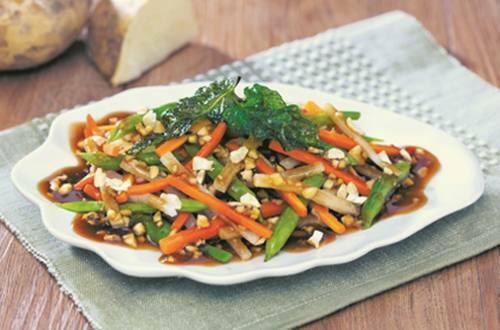 Remove the vegetables and transfer to a plate to avoid overcooking. 2 Now let's get ready to make the sauce. Get another pot and combine the brown sugar, water and soy sauce together. Just bring to a boil before thickening with coprnstarch dilluted with water (slurry). 3 Throw in half of the garlic and peanuts to the vegetables and mix well. While leaving some for toppings. 4 Lumpiang Hubad is now ready to be enjoyed by the whole family. Simple yet full of flavour. What are you waiting for, let's eat!